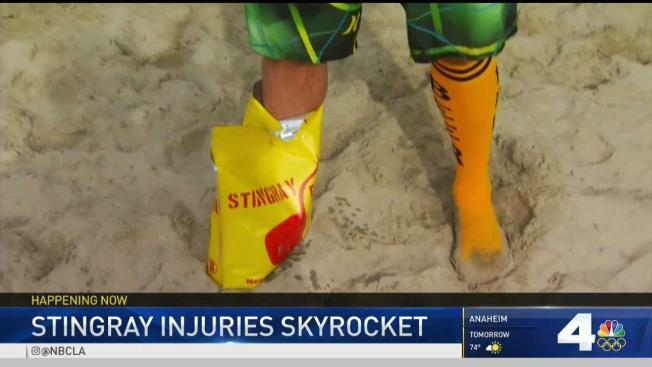 Officials say a new stingray injury record at Huntington Beach was reached when 73 people reported injuries in a single day. Marine Safety Lt. Claude Panis tells the Orange County Register in his 40 years of working as a lifeguard at the beach, he never saw so many stingray injuries reported to the level it reached on Friday. Panis says the spike in stingray injuries is in part due to extreme low tides, small surf and warmish water in the low 60s along with a holiday crowds in town and people off work and school. On Thursday, 45 stingray injuries were reported to Huntington lifeguards, a number also higher than usual. In the past four days alone, there have been nearly 200 injuries reported. Lifeguards plan to educate people on techniques to keep stingrays away. One way beachgoers can keep themselves safe from the wrath of a stingray is to do the Stingray Shuffle. The movement calls for people to kick sand ahead of them as they enter the water to scare off the animals rather than take regular steps, which can result in some accidentally stepping on the stingrays.